Editor’s note: This is part of a series of profiles for fall 2016 commencement. See more graduates here. Lubold, who is from Los Angeles, is a National Merit Scholar and chose ASU because of Barrett, the Honors College. His honors thesis project focused on Fourier analysis and statistics. “We proposed a statistical algorithm which combines multiple sets of data in order to better detect ‘jumps.’ For instance, in the context of magnetic resonance imaging (MRI), a ‘jump’ could be a mass or some irregularity in the body that doctors are interested in seeing and analyzing. The algorithm takes the data, which are inherently corrupted by noise and error, and reduces the contribution of this noise and error, allowing doctors to more accurately analyze the mass,” Lubold explained. Titled “A Statistical Framework for Detecting Edges from Noisy Fourier Data Using Multiple Concentration Factors,” his Barrett honor thesis project earned him a $2,000 Summer Enrichment Award from ASU to work with mathematics professor Anne Gelb. Lubold also participated in Computational Science training for Undergraduates in Mathematical Sciences (CSUMS) led by President’s Professor Eric Kostelich. Lubold studied stochastic processes and numerical methods to analyze cancer growth in rats. This summer, he worked on another research project with assistant professor Jorge Carlos Roman at San Diego State University. Their first paper, which Lubold co-authored, is “Non-asymptotic Bounds on the Root Mean Square Error in Gibbs Sampler Algorithms." They hope to have a second paper published on this topic by end of spring. Lubold wants to continue doctoral studies in statistics or applied math. He has applied to the Fulbright program to study in Europe, and to numerous top doctorate programs. After earning his doctorate, he would like to pursue an academic career — researching, teaching and mentoring students. “Shane has one of the highest cumulative grade-point averages among the graduating majors in any of the school's undergraduate degree programs. He earned this by succeeding in a number of the most challenging highest-level classes in our program,” said Matthias Kawski, President’s Professor in the School of Mathematical and Statistical Sciences. Lubold, who is receiving the Undergraduate Award for Excellence in French, answered some questions about his experience at ASU. Question: What was your “aha” moment, when you realized you wanted to study math? Answer: My "aha" moment was during Dr. Thieme's MAT 300 class. I realized I really enjoyed the logic and rigor of the class, and knew then that I wanted to continue studying math. I enjoyed the level of abstraction of the class. Q: What advice would you give to high school students interested in possibly majoring in math? A: My advice to high schoolers is to know that college-level math is very different from high-school-level math. There is more emphasis on logic, proofs, and justifying why and how math works. Q: What do you think is misunderstood about math by the general public? A: The general misunderstanding the public has about math is that it only involves numbers. Most classes I've taken focus on proofs, and so they tend to involve few (if any) numbers. Q: What’s something you learned while at ASU that surprised you, that changed your perspective? A: One of my favorite topics that continues to amaze me is the idea of size, or cardinality, of sets. There are many "types" of infinity, and these ideas play a crucial role in many proofs in modern mathematics. It really changed my perspective since the conclusions we can draw from these "types" of infinity can be counterintuitive. Q: What’s the best piece of advice you’d give to those still in college? A: Pursue whatever you are interested in. Find something you are passionate about, and you will enjoy spending time doing it. 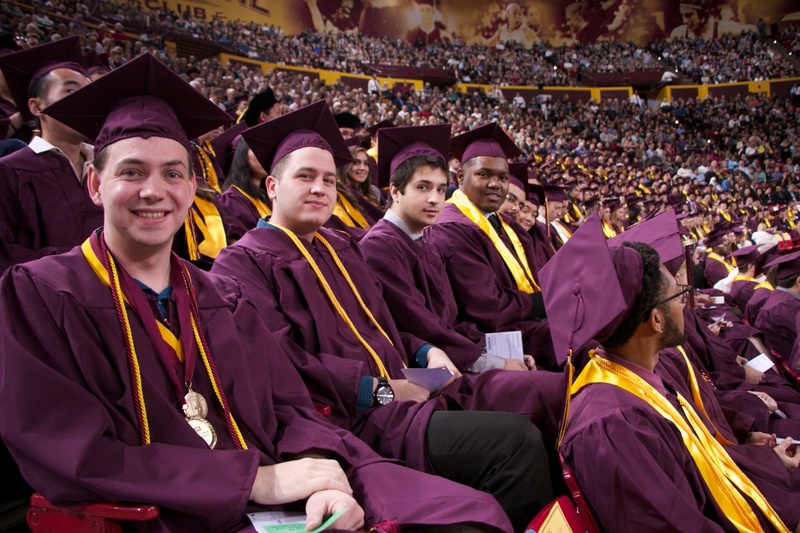 A: I chose ASU because of Barrett's honors program. I really enjoyed the Human Event [an intensive, interdisciplinary seminar required of all lower-level Barrett students] and feel that it provided me with a wide array of authors, ideas and books that I continue to explore to this day. Taking honors courses and completing honors projects gave me the chance to connect with professors and explore extra topics. A: On campus I can be found at the MU Starbucks, where I can work on homework, meet friends or just read a book. The atmosphere is very conducive to working. Q: When not studying, what do you like to do for fun? A: I like to play tennis, watch Netflix and travel. A: With $40 million I would be interested in helping to resolve some of the issues we have in our educational system. Education is a critical component of a person's success, and by providing everyone with a quality education we can set people up on the path to success. Sun Devil Women’s Basketball is back in action on Dec. 21 as they host Holy Cross at 5 p.m. during Maroon Monsoon. Tickets are still available starting at just $8.